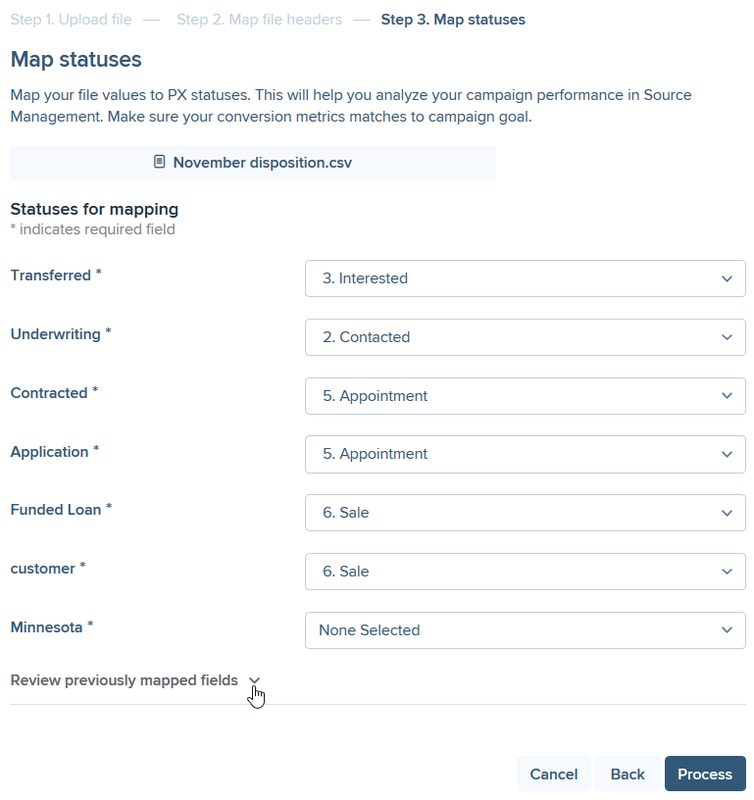 With PX Disposition, you’re able to assign disposition data to leads purchased through PX. This gives insights into your leads sales funnel, conversion % to different stages, drop-off rates, source-by-source and overall campaign performance. 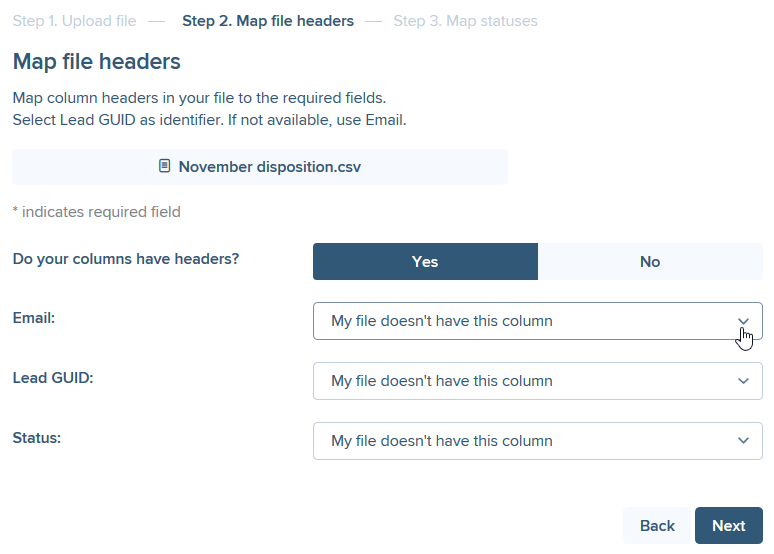 Uploading disposition data is an easy process, as PX remembers your file format and mapped fields. To upload a disposition file, go to Disposition Management page and navigate to Upload file block. Formatting your file correctly is important, make sure it meets all the requirements. You can change lead disposition for a single or multiple leads or upload all leads in one disposition file. 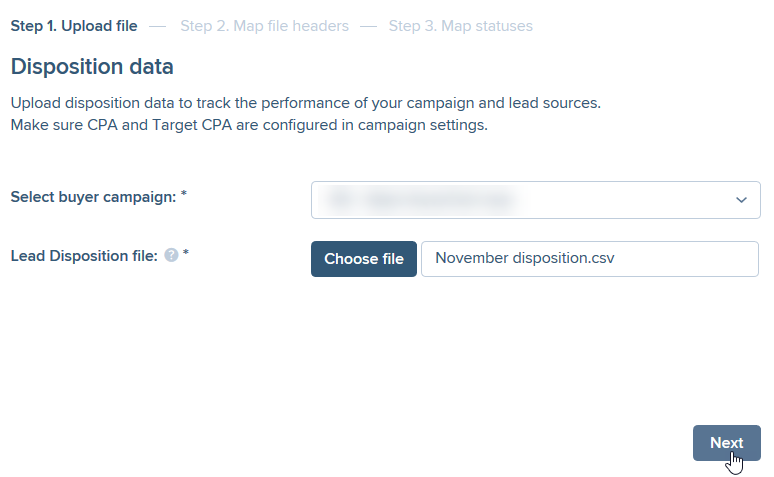 Before you begin, make sure the Target CPA and Status are set in campaign settings. A disposition file must include at least 2 columns: the lead identifier (email or lead GUID) and its current disposition status (contacted, interested, etc.). You can upload files with the same leads as many times as you need, the status of the lead will be updated accordingly. Include column headers to make the mapping procedure in Step 2 more convenient. See the example disposition file at the end of the article. You can also use services to check your CSV files, for example, CSV Lint. To upload the disposition file, select the campaign and click Choose file. If there is something wrong with the file, an error message will be displayed. Please upload disposition files separately for each campaign. 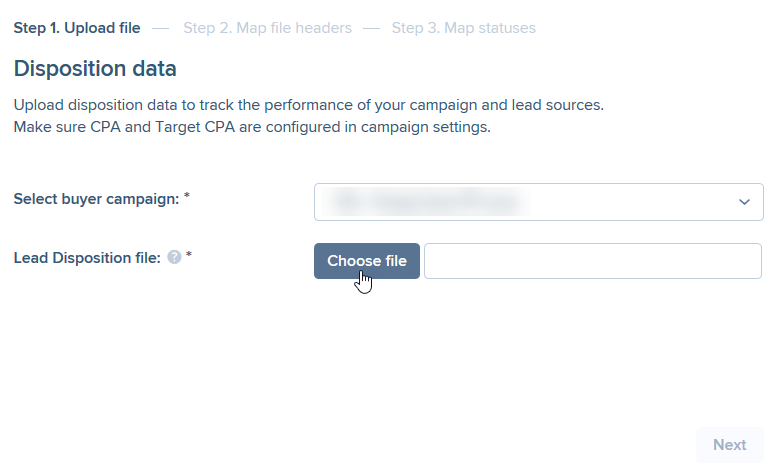 Make sure your file contains leads bought by only one campaign selected above, otherwise, lead statuses won't be updated correctly. On the next step, map Email and/or Lead GUID, and Status between the uploaded file and PX settings. 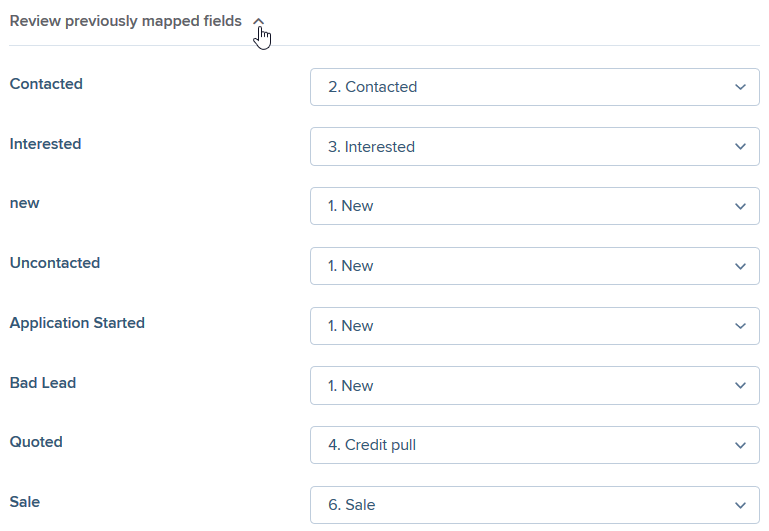 Next time when you upload the file with the same structure, fields will be mapped automatically. Enter the necessary number in a Search field if there is no item you need on the list. If the uploaded file does not contain headers, click No. Сount columns manually in your file and map each of the required fields to appropriate column numbers. If there is no corresponding column in the uploaded file, select My file doesn’t have this column checkbox. Avoid selecting this checkbox for Status field and both Email and Lead GUID (at least one of these two columns must be mapped). Otherwise, the file won't be processed correctly. Click Process as soon as you're done. Follow How to Map Disposition Statuses article for more information. Click Back to return to the previous step (all your configurations on the current step will be saved). Click Process to finish the file upload. If everything is mapped correctly, the information about the uploaded file appears in Dispositions spreadsheet. You can also see the leads uploaded in the file on Leads Overview page by sorting it by Disposition column.